So back around Halloween, a friend of mine's daughter-in-law saw a quilt set for sale. It was a custom set for crib size and had the whole package, bumper, quilt, skirt and it was WAY out of her price range, not to mention she wanted a twin size. 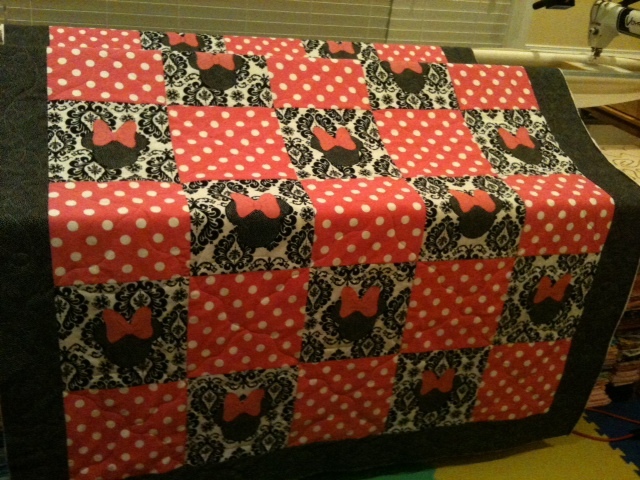 She mentioned to my friend that she was going to have a friend of hers (who's sewn clothes but never quilted) make it. My friend halted her there and reached out to me asking if I could recreate it in twin size. A quick look at it assured me I could do this and so off I went. They paid for the materials since I'd have to buy new fabric across the board for it and a new batting b/c I didn't have twin on hand and I made the quilt. Hehe - quilt photos are further down but I had to share how I "wrapped it". I saw this ribbon in the Wal-mart craft section adn couldn't resist. I had trouble determining how to quilt this one but then realized I wanted the Minnie's to be the stars and so a "frame" would suit them and in the pink dot squares, an off-kilter X was easily the way to go. In the borders (you can see it a bit in the folded phot above) I did a wide loop de loop (how the heck do you spell that anyway?) I think it works and keeps it fun like Disney. I love it! What a great friend you are! LOVE that ribbon Becks. And the quilt is divinely perfect! That's how I'd spell loop de loop too . Can you sell these please? ?